The pictorial theme in the December issue of Believer's Magazine is of birds, and there are some striking images of a number of them. 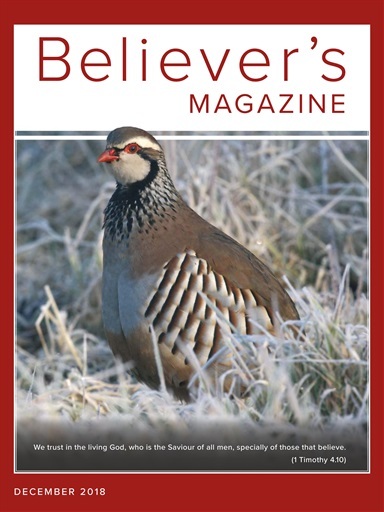 There are spiritual lessons to be learned from them, too, and a study of those birds that are mentioned in Scripture as illustrations of the Lord Jesus will refresh the soul of those who love Him. The subject of the human spirit and its many conditions is considered in an article by seasoned writer Walter Gustafson, and John Parkinson presents a well-reasoned argument for the unique trustworthiness of the Bible. For those interested in the work of the Lord in different countries, Robert Revie's report of the growth in Christian witness in Ethiopia will be encouraging, as will the continuing series on Christians in Italy years ago. 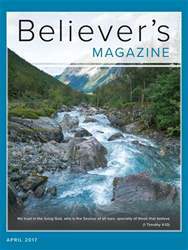 These and other articles are for your interest and spiritual edification, and we hope you enjoy another issue of Believer's Magazine.